What’s in the baaaaaaag? C’mon … what’s in the bag? Yep. This little bag is with me at all times. All. Times. 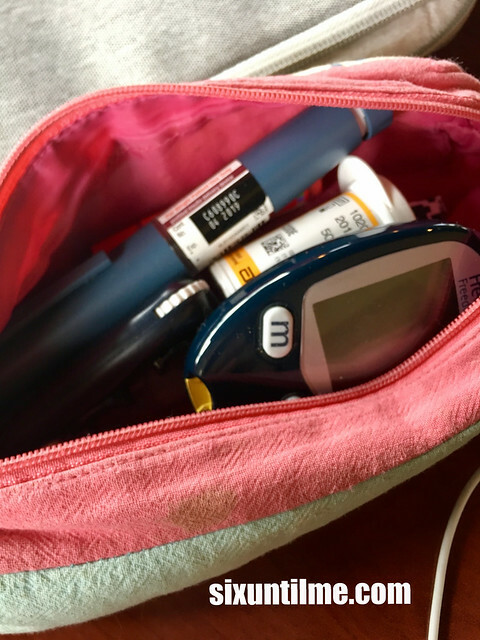 My daughter picked it out years ago and I’ve been dragging it around the world with me since, housing essentials for my diabetes management. Meter, test strips, lancets, lancing device, an insulin pen in case of pump failure, and a pen needle tip. (And chapstick, but that’s not essential for diabetes. Just for lips.) With these things, I can calibrate my CGM, keep track of my glucose results, and take a dose of insulin if needed. Without these things, I’m not okay. Not healthy. And without these things for several days, I’m dead. Humbling what sits in a pencil case bag. Come back every day in November for a look into life with diabetes, from the perspectives of people living with it, clinicians caring for us, and the caregivers who support us. 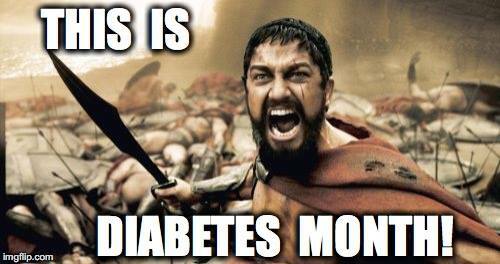 National Diabetes Awareness American Month Diabetes … Month? Diabetes Month: Ask Me About My Diabetes. Diabetes Month: The One About Anxiety Diabetes Month, Diabetes Year. I was in Atlanta over the weekend and a fellow spotted me testing my blood sugar. He approached me and asked me which meter I used. Turns out he is a newer type 2 and he had a ton of questions about gear and how I do things, but he really wanted to hear about the bag. I admit pride in my bag, (it is a Mybetic bag) and he wanted one. Bonding over a bag? That is pretty darn cool, even if your bag is black and boring. Mine is very similar! I’m curious why no glucose tabs or similar… I’m sure you have that on you all the time too, and I keep mine (whole wheat fig bars and jelly beans) in my case with all the rest! I also have a myabetic wallet in cherry red, my favorite color. It doesn’t fit in the myabetic but I ALWAYS have with me a bottle of glucose drink – I DO NOT like the tablets. Or hard candy, orange juice or such. I took the pouch off the Dexcom CGM so that it fits in the zipper pocket at the back. I love the myabetic wallet. Its been awhile, since I added my 2 and a third cents worth, probably is what it’s worth, before I forget, how’s the kitty cats? I carry all of the same equipment as you in my left shirt pocket, sans chapstick, that I carry in the left vest pocket. Also 1 pen needle in the meter case as a just in case all else fails. I still don’t pump. Old fashioned I guess plus insurance won’t help cover it so MDI for me still. I got a small prescription bottle that I carry 4 needles in it and I just stick the used ones back in the bottle and empty the bottle at the end of the day, works for me. I still enjoy your blogging. You take care, as I know you will! !